It’s not rare to see guitarists – especially less experienced ones – who have some established ideas about the type of guitar that they want to play on, due to the look or the value which they may have with those instruments in a particular environment. The leather strap guitar is no exception here – chances are, if you’re after a leather strap then you do because you find it appealing and you love how it looks on you. There’s nothing wrong with that, sure – but there are some downsides to choosing your equipment this way. Here, we’ll have a look at some of the benefits and downsides of using different types of guitar straps, and we’ll (hopefully) help you pick the best one for you. The issue with buying a leather strap guitar for its appearance is that musicians tend to overlook some of the flaws of this accessory – for example, cheap leather guitar straps don’t last very long. The ridges used to slide the strap buttons are quite open to various forms of wear and tear, and prolonged use often causes them to lose friction and prevents them from firmly securing the strap button, which in many cases results in the guitar being dislodged from the strap, and falling to the floor during your performance. 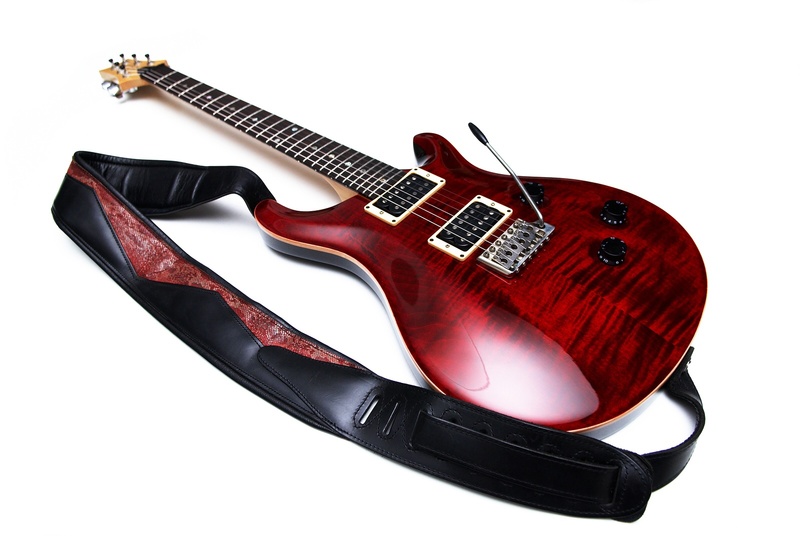 Which brings us to the next point of importance – if you’re thinking of buying a leather guitar strap, you’ll need to seriously consider how you’re going to attach it to your guitar. As we mentioned above, the button holes on leather guitar straps can usually wear out and let the strap buttons slip out – players who’re thinking of purchasing a leather strap should definitely look into a locking one, or attach a strap lock system that can ensure that the guitar is securely attached to the strap and not very likely to just fall off. Remember that a leather guitar strap can also cause quite the discomfort – usually it won’t come with any padding, and this can cause the material to really dig into your shoulder under the guitar’s weight. No matter how cool it may look, a guitar strap that gives you discomfort when you’re playing it is just not worth it. That said, if you buy a high-end leather strap you can usually get around this problem, as high-quality leather can be as comfortable as any other material – you just have to try it out to see which one fits you best.